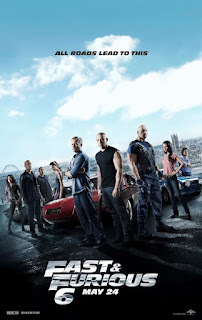 At this point, the cast, budget, and level of spectacle in this series have all grown so much that FAST & FURIOUS 6 resembles a cross between Steven Soderbergh's OCEANS series and the James Bond franchise at its most excessive more than it does the modest little action film about car thieves and an undercover cop trying to bring them down that kicked things off back in 2001. But you know what? That's ok. This is one blockbuster franchise where “bigger and better” aren't necessarily dirty words. Picking up where FAST FIVE left off, former cop turned outlaw Brian O'Conner (Paul Walker) and his one-time adversary turned best friend/brother-in-law Dominic Toretto (Vin Diesel) have left behind their criminal lifestyle to settle down and enjoy their ill-gotten gains. Brian's wife/Dom's sister Mia (Jordana Brewster) has just given birth to a baby boy, so obviously these guys can't be off risking their lives trying to pull another job, right? Right. 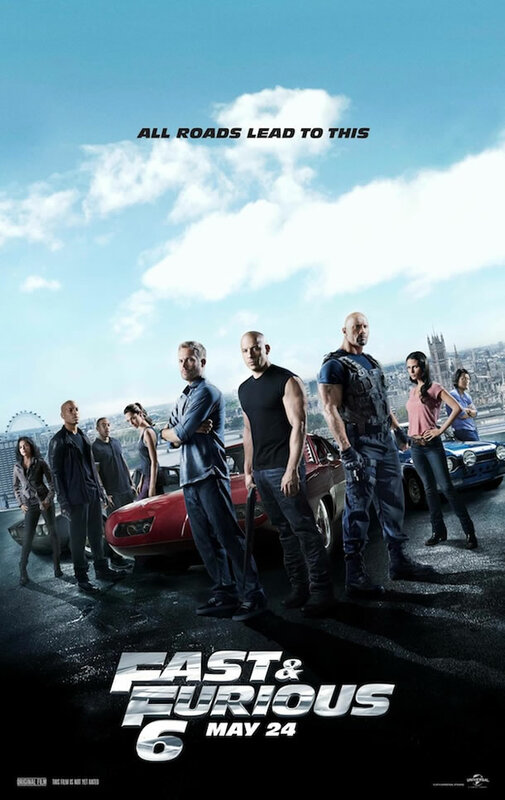 Not surprisingly Brian, Dom, and the rest of their gang – Roman (Tyrese Gibson), Han (Sung Kang), Gisele (Gal Gadot), and Tej (Chris “Ludacris” Bridges) – get pulled back in danger when Hobbs (Dwayne “The Rock” Johnson) comes calling for help in taking down a gang of crooks, led by ex-military tough guy Shaw (Luke Evans), who utilize high-tech vehicles and insane driving skills in their heists. Dom isn't interested at first, but when Hobbs reveals that someone he (and fans of the series) thought was dead is alive and well and working with the crooks, he agrees to get the band back together. Joining in on the fun is Hobbs' new partner Riley (Gina Carano). And since she's in the trailer, is it really a spoiler to tell you the previously assumed dead character is Letty (Michelle Rodriguez)? From this point on, it's all car chases, hand-to-hand combat, and ludicrous action set pieces interspersed with moments of comic relief and just enough time for plot remind you that the film has one, however slim. In other words, what you'd expect from this series by now. Sure it's formula, but it's a formula the cast and crew have perfected. The screenplay by Chris Morgan (only one credited writer on a major Hollywood film? I didn't think that even happened anymore) deftly juggles its large cast, making sure everyone's favorite characters get a chance to shine without bogging down the lightweight plot. Director Justin Lin is just as comfortable with quiet character moments as he is with staging ridiculously over the top action sequences. Both these guys, as well as most of their cast, have been with the series since the third installment, and one gets the sense there's a real family kind of vibe between everyone. Aside from the regulars, I have to single out Gina Carano. She showed potential in her Steven Soderbergh star vehicle HAYWIRE, but in the end the film let her down. Even though her role here is only a supporting one, it showcases her talents far better with a couple of top notch martial arts throwdowns and not too much heavy lifting in the acting department. It was also nice to see TEDDY BEAR star Kim Kold in a small role as one of the bad guys, even if he doesn't get much to do. The action sequences are thrilling, and even though the film does go in for some of the fast-cut editing that normally drives me insane, you can still tell what's going on. So much credit to Lin and his editors for understanding that fast and intense doesn't have to mean sloppy and incoherent. Of course the film is still first and foremost intended as a big studio cash generator, but the cast and crew seem to have a genuine love for the material and these characters, and a desire to make the best trashy action film they can. And really, what more can you ask from a movie like this one than that? 3 out of 4 stars.